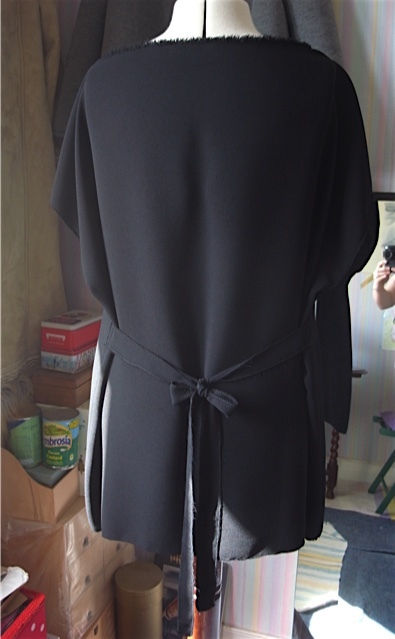 I added ties to the black crepe rectangle top I made a while ago, was just playing about to begin with to see if I could add shape to it. And it worked. Wore it on a girls night out recently, only I ended up wearing it with flat sandals, didn’t take any pics unfortunately as I didn’t think I looked any good, but on reflection I didn’t look any worse than anyone else there that night. And I was comfortable. 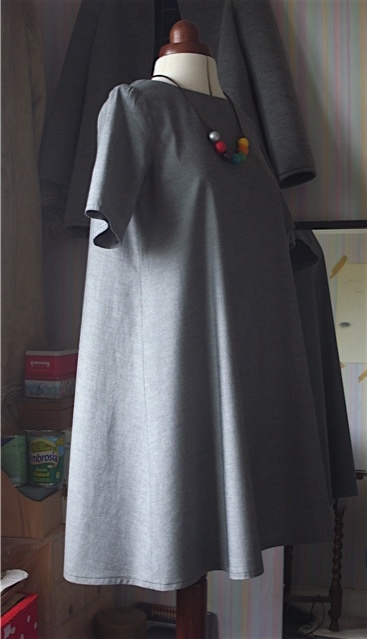 I simply cut out two strips of the fabric the same as the top, and zig zagged all the way round the edge, then sewed them to the side seams. Simple yet effective. 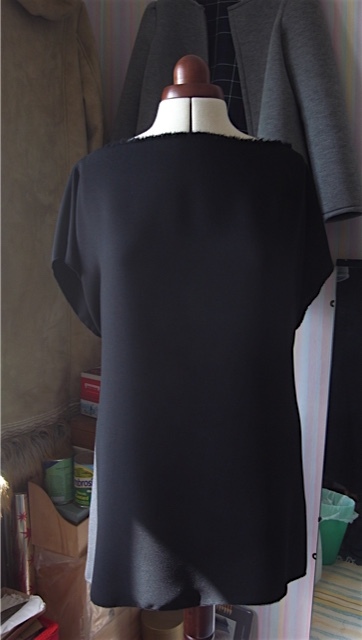 Shortened another dress. 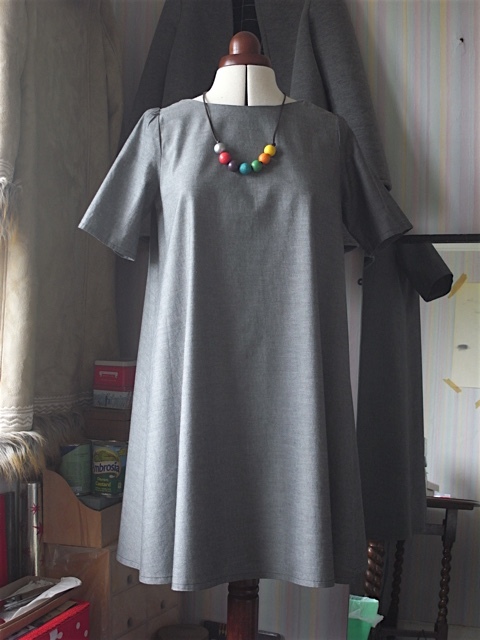 This time the grey Trapeze dress. Only not exactly shortened but decided to hem it properly, so it was shortened by about 1.5cm. 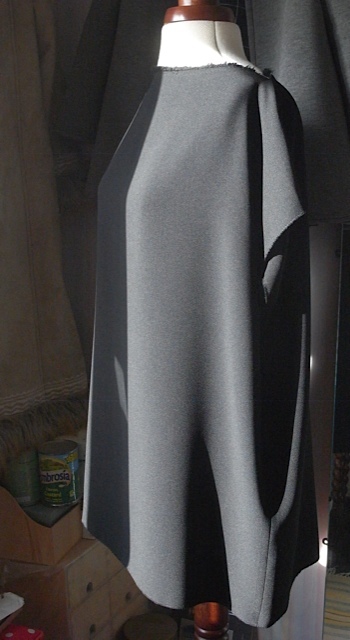 I think it shows the way the hem dips down to the back more clearly. I’m very happy now. Loved it before but wasn’t happy with how frayed it looked even though I’d zig zagged the edge. Its only a slight difference, but above is before and below is after. So I made two jersey striped Trapeze tops in one weekend! Yes I did. 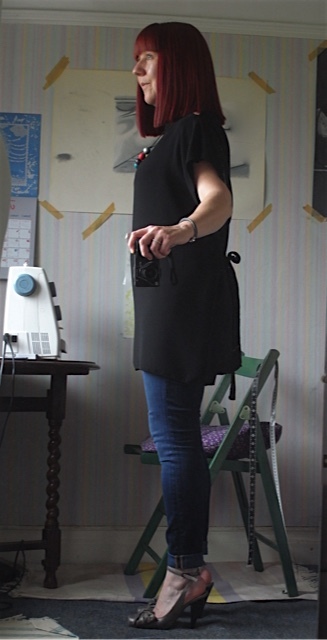 So am I ready for the Great British Sewing Bee? I don’t think so! How the hell they make anything more complicated than what I made in that weekend is beyond me. I timed myself from start to finish and I made it in one go, so no stopping, on the Sunday, which means from ironing, cutting out the fabric and making it. And it took me 3hrs 15 mins. 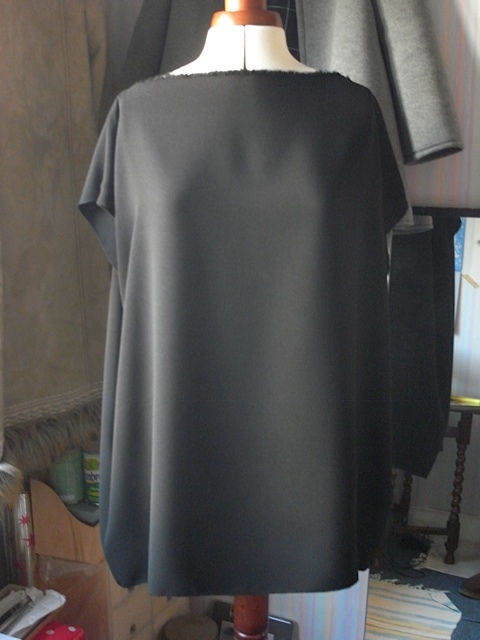 And thats a simple top that I’ve made many times over. So how the Sewing Bees make the likes of the Chinese style top in the international episode in 3 hours or so completely bogles my mind! Hats off to them I say. 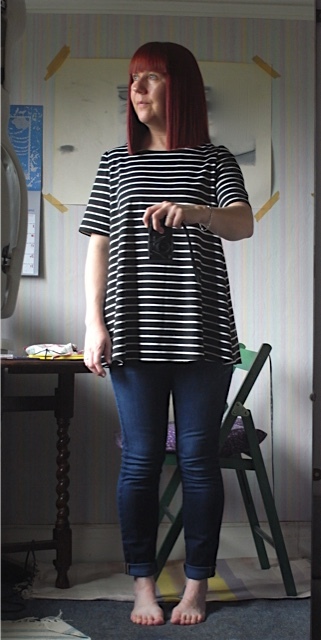 I loved the first striped jersey Trapeze top I made so much I really wanted to make another. 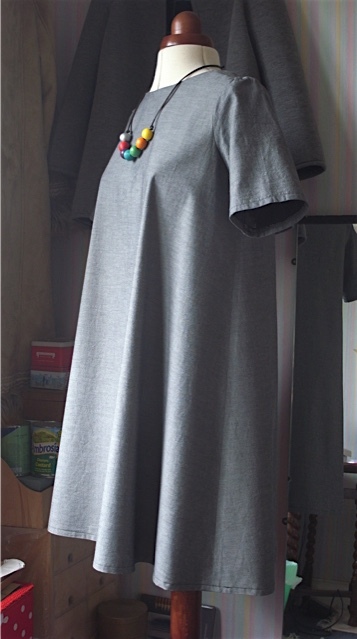 However the fabric on that one pills like mad, I’ll still wear it but it does’t look its best now. 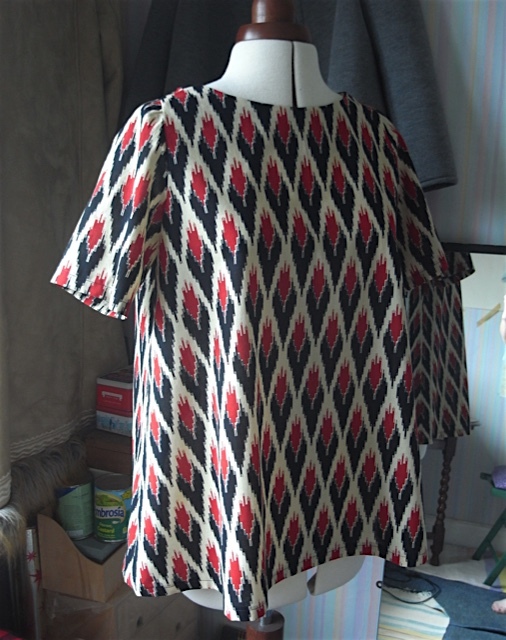 However the next lot of jersey fabric I bought from The fabricgodmother.co.uk was a little different, I’d already made the stripey Trapeze dress, and I got the feeling it wouldn’t pill as bad, if at all. 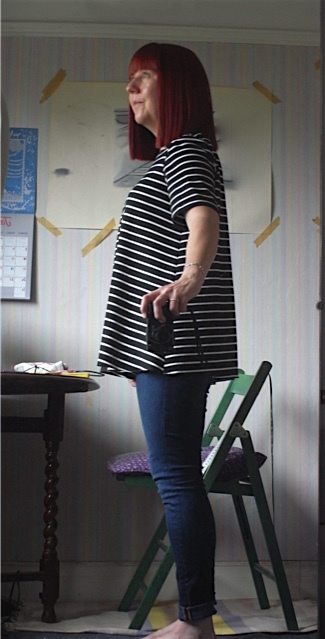 So now I have three stripey jersey Trapeze tops and they are lovely and so comfortable to wear. And just wash, hang up, dry and go. Perfect! 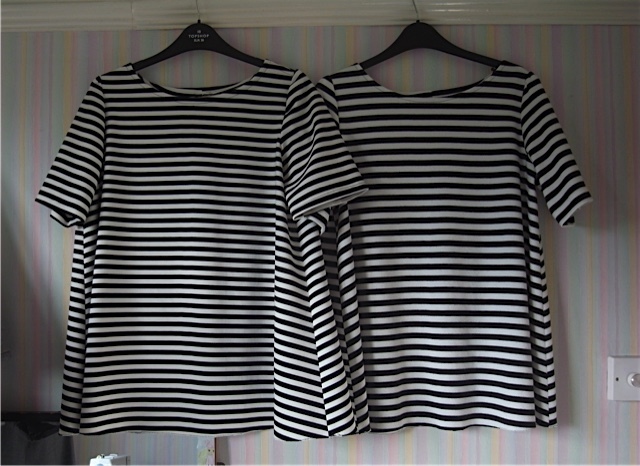 So what you see there is two very similar stripe tops, the one on the right is the first one and although you can’t tell in the picture its very bobbly. The one on the left is the new one and its a much smoother feeling fabric. I’m hope it won’t pill like the first one. Also the stripes are slightly thinner on the one on the left. 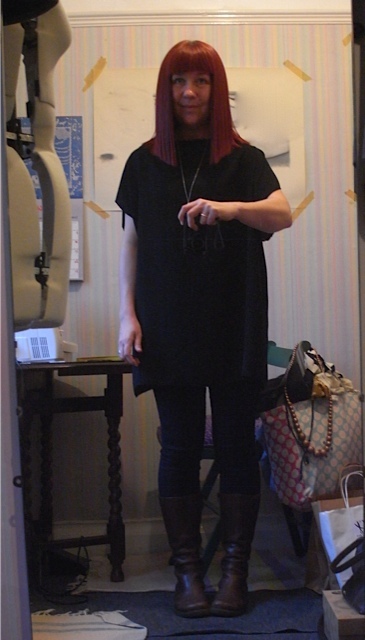 Here I am wearing the one I made on the Sunday. Stripe matching was once again terrible but I don’t care anymore. Almost looks like its supposed to be like that! So for a very quick and gratifying make I can’t recommend a jersey Trapeze enough. One of my work colleagues was going home to India last year for a visit, and I asked her if it wouldn’t be too much trouble and she had the time, if she could possibly bring me back some fabric? She was unsure as wasn’t sure what I would like or what sort of colours I like. I said I really didn’t mind anything, but can’t do Yellow! So she said she’d see what she could do. I of course said I’d pay her, and I didn’t mind what cost, we discussed what I usually paid for fabric here and she seemed happy she could probably find me something. I was just excited at the possibility of something different, maybe something I wouldn’t pick for myself. And boy did she deliver. I loved it when I first saw it. The pattern was quite different to anything I might have picked for myself, so I was pleased about that. However it did take me nearly a year to make it into something. And guess what I made? Oh yeah you don’t need to its in the title. DOH! 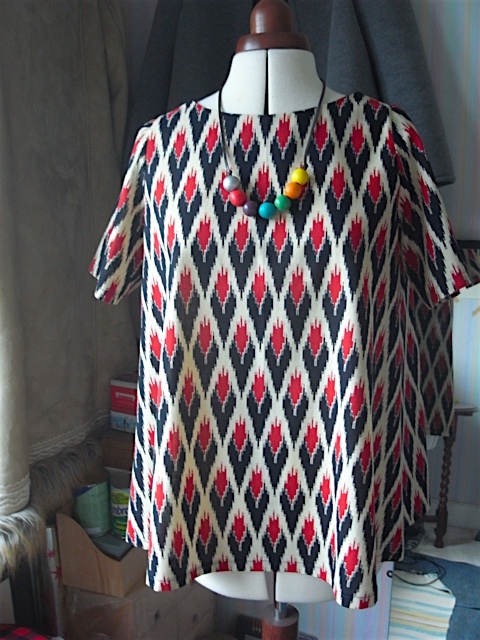 There we are, a lovely Trapeze top. I’m not sure how much fabric there was, but I think at least 2 meters. 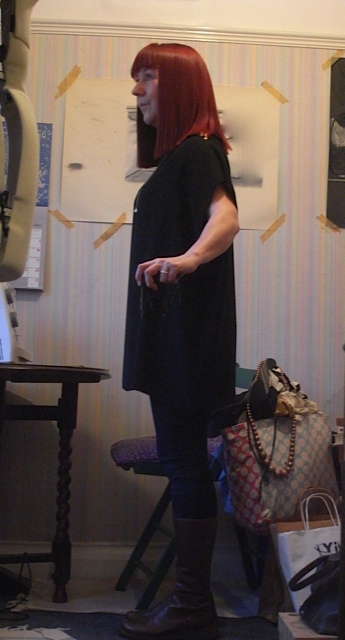 One of the reasons it took me a while to turn it into anything was I wanted to make a Trapeze top but didn’t know if I’d have enough, as the fabric was about 115cm wide. Unfortunately I lost the pic of the pattern pieces laid out on the fabric, as there was only just enough, and it was lucky I wanted to make it with short sleeves. 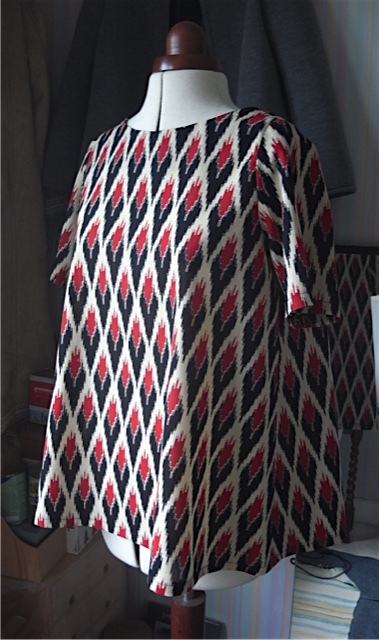 Took me a while to decide which way up I wanted the pattern to be, but I think really its a no brainer that the red is at the top. At first I could see a sort of abstract flower design in the pattern but rather disturbingly it turned into a red devil wearing a black suit! What do you think? Anyway I love it, and Gigi wouldn’t let me pay for it as she couldn’t remember how much it was! So I’ve named it the Gigi top. Not sure if the necklace goes or not? I love it, the cotton is so so soft, feels like I’m wearing a cloud. It will be perfect for when/if the summer ever gets going.